Peanutbutter is a cute little kitty who thinks she works in an office. She wears her little hat and tie and often falls asleep on the reams papers overflowing her inbox. Jeremy is the crafty crow who lives in the tree outside of Peanutbutter’s window. Jeremy tries to trick Peanutbutter again and again and steal her hat. Somehow Peanutbutter and Jeremy build a friendship together. The premise could hardly be simpler, but in James Kochalka’s hands it is pure magic! This book will delight everyone from wide-eyed children to jaded hipsters! On the surface the story is silly and fun for kids, but for adults it is a clever critique of modern society! It’s not called their “Best Book Ever” for nothing! 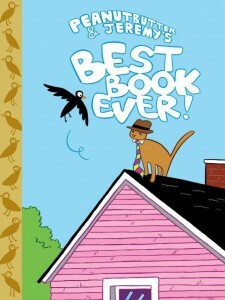 Now the digital version of Peanutbutter & Jeremy’s Best Book Ever is even better! It includes bonus bits that can’t be found in the print version. 280 page paperback. Black and white comics with color covers.